Washington Irving and His Literary Friends at Sunnyside, 1864. Steel line and stipple engraving. 56 x 78.5 cm. Engraving by Thomas Oldham Barlow (1824-1889), after a drawing by Felix Octavius Carr Darley (1822-1888), made from photographs by Mathew B. Brady (1823-1896), in conjunction with an oil painting by Christian Schussele (1824-1879). 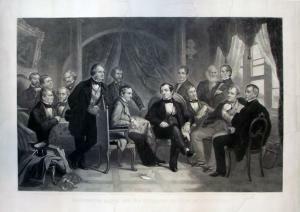 The painting came quickly after Schussele’s 1862 success with Men of Progress, a similar painting representing nineteen distinguished American inventors. In fact, one 1863 reviewer begins by mentioning the lack of novelty in the design of such works. 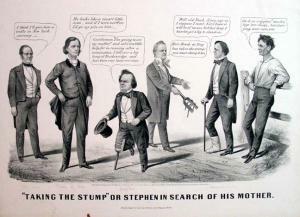 It was a common format to draw together prominent men, particularly in a time of war, when groups of generals and politicians were often seen in contemporary illustrated newspapers and journals. However, the Washington Irving painting and engraving found tremendous success with the public. A small booklet was prepared and sold at the gallery describing the making of the two works, along with biographical sketches of each of the sitters. Sketches of Distinguished American Authors, Represented in Darley’s New National Picture Entitled Washington Irving and his Literary Friends, at Sunnyside (New York: Irving Publishing Company, 1864). According to the booklet and the press, the making of the engraving was a long and elaborate process. The original sketch or design was created by Felix Darley, who has a long history with Irving’s work and with the writer personally. To help with this drawing, Mathew Brady was hired to photograph the individual sitters. 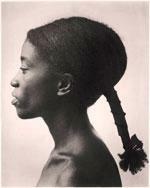 Some of these photographs can be seen today at the Library of Congress Prints and Photographs division. According to the Times, another final photograph was taken of the whole design, which is the source the engraver, Thomas Barlow, worked from over a period of three years. In a separate studio, Schussele rendered the work in oil. 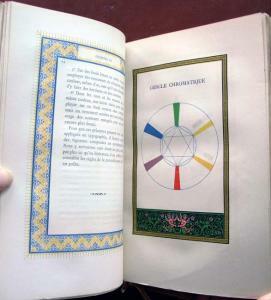 The edition had four separate grades and prices. Artist’s proofs sold for $50, proofs before the lettering were $30, India proofs sold for $15, and the final prints for $10. The booklet was an extra 15 cents, which also gave you free admission during the exhibition of the painting. The introductory text of the booklet is so appealing that I include it in full. If you would like to read it, continue below. Continue reading The Sensation of the Day is the Great National Painting. Although the images might be pleasant to look at, please note that there is no such contest or exhibition of winning entries associated with The Hirshhorn Museum and Sculpture Garden (the correct name and spelling). This is a wonderful museum, where the actual names of artists are always listed along with the work, unlike this blog spam. It does a disservice to the Museum and to Peter Callesen, http://www.petercallesen.com/ the real artist of these cut paper works, to scam the readers with this incorrect information. I’m sorry that so many legitimate bloggers did not check the information before posting it and passing it on. La Orquesta: Periódico Omniscio, de Buen Humor y con Cariaturas, often referred to as the Mexican Punch, was a satirical journal published out of Mexico City between 1861 and 1877. Graphic Arts holds 106 consecutive issues, each consisting of four pages of text and a full-page lithographic caricature. 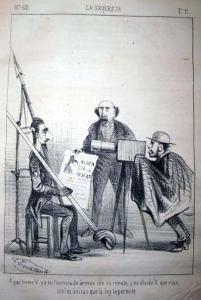 Most of these caricatures were drawn by painter and social satirist Constantino Escalante (1836-1868), who was also one of the journal’s editors. Orquesta’s constant criticism of the Mexican government led to Escalante being arrested and jailed on more than one occasion. 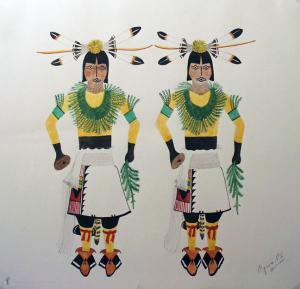 In the Western Americana division of Rare Books and Special Collections is a small collection of paintings and drawings by 20th-century Native American artists, including Alfonso Roybal, also known as Awa Tsireh or Cattail Bird (1898-1955), Abel Sanchez, also known as Oqwa Pi or Red Cloud (1899-1971), and Otis Polelonema, also called Lomadamocvia (1902-1972). 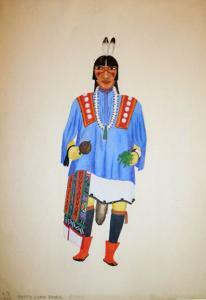 Roybal or Awa Tsireh was born and died in the San Ildefonso Pueblo, Santa Fe County, New Mexico. His father, Alfoncita Martinez Roybal was a Pueblo ceramicist and both his brother, Ralph Roybal, and sister, Santana Roybal Martinez, were painters. Tsireh’s work was first recognized outside the Pueblo in 1920 when Alice Corbin Henderson sent a collection of his work to the Arts Club of Chicago. Several of the drawings at Princeton are identified as once belonging to Henderson. Tsireh worked full-time as a painter, printmaker, lithographer, silversmith, and watercolorist in a studio of his own inside the Museum of New Mexico, Santa Fe. 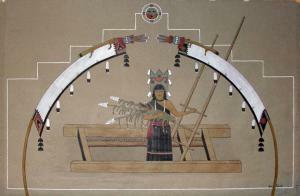 Sanchez or Red Cloud was a colleague of Roybal, also born at San Ildefonso Pueblo, New Mexico. But unlike Roybal, Sanchez pursued a career in politics, serving as Lieutenant governor and governor of the Pueblo, while painting as he found time. women/dehuff/taytay/taytay.html). Polelonema returned to his village, Shungopovi, where he farmed and painted, including a few years working under the mural division of the Federal Art Program. The Sublime Society of Beef Steaks. Pickles not allowed till after the third helping. 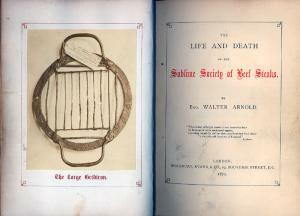 Walter Arnold, The Life and Death of the Sublime Society of Beef Steaks (London: Bradbury, Evans, & Co., 1871). 7 plates (incl. 6 mounted albumen silver prints). Graphic Arts division GAX 2008 in process. The rockwork that surrounds it. I am posting this Saturday at 5:00 p.m., in honor of the weekly meeting of the Sublime Society of Beef Steaks. From 1735 to 1869, the 24 members of this London dining club, along with their 24 guests, met to eat a beefsteak dinner, drink plenty of wine and sing. Needless-to-say, it was for men only. Their visual identity was the gridiron and as the location of their dinners changed over 134 years, the original gridiron of the society moved along with them. In each venue, it was ceremonially hung in the centre of the ceiling, over the presidents chair. An albumen photograph of the gridiron is seen above, tipped into Arnold’s book as its frontispiece. 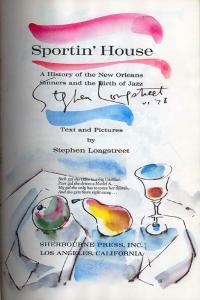 Stephen Longstreet (1907-2002), Sportin’ House: New Orleans and the Jazz Story, A History of New Orleans Sinners and the Birth of Jazz. (Los Angeles: Sherbourne Press, ). Extra illustrated with watercolors by the author dated 1978. GAX ML 3561.J3 L63. /firestone/rbsc/aids/gc088.html; and perhaps, most interesting of all, is this copy of Sportin’ House. 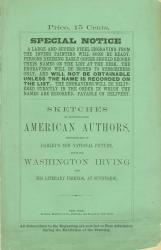 Princeton’s copy is extra illustrated with watercolors drawn by the author directly onto the pages of the book, including the title page which he signed and dated. Born in New York City and raised in New Brunswick, New Jersey, Longstreet moved to Paris in the 1920s to study painting. It was there he began creating watercolor portraits of such luminaries as Gertrude Stein and James Joyce. 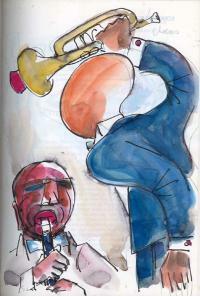 His evenings were spent at the Paris jazz clubs where he got to know the music and the musicians. Today, some of his best known books include Storyville to Harlem: Fifty Years in the Jazz Scene (1986) Oversize Rare Books: Western Americana collection ML87 .L66 1986q and Jazz From A to Z: A Graphic Dictionary (1989) Graphic Arts division Oversize ML102.J3 L66q. Albert de Rochas, Le livre de demain (Paris: Raoul Marchand, 1884). 432 pages, complete in 44 fascicles. Full morocco binding by Wendling. One of 250 copies signed by De Rochas and the publisher. What were the options for book publishers and printers in the late nineteenth century? This ‘Book of Tomorrow’ answers that question by offering the reader an amazing mixture of paper, ink, color, graphic arts and typography spread throughout 44 meticulously printed sections. Divided by physical elements (color, paper, ink, etc. ), each section offers examples of French poetry or short prose printed on a variety of paper colors, weights, and textures, using a multitude of fonts and inks, with diverse illustrative formats such as photolithography, collotype, etching, and collage. Not a single ornamental border is repeated in the same colors or patterns throughout the 432 pages, and many decorative elements are heightened with gold or silver. The last principal fascicle contains 10 paper samples from papyrus to Chinese and Japanese papers. Next time you find yourself in a graphic rut, check out Le livre de demain, Graphic Arts division, GAX 2008 in process. The Chain gang included J.A. Chain, a partner in the Denver Chain and Hardy Bookstore; his wife, painter Helen Henderson Chain (1848-1892); and their son Fred. The credit on the title page of this album implies that it was J.A. who created the albumen photographs, but there is good reason to believe the album itself was assembled and embellished by Helen. Of the 19th-century western artists, Helen Chain was Colorado’s most prominent female painter. She settled in Denver in 1871 but traveled to Europe and to New York to study; in particular, spending one season working in the studio of George Innes. She illustrated several books, including John Lewis Dyer, The Snow-Shoe Itinerant. An Autobiography of the Rev. John L. Dyer. . . (Cincinnati, Published for the author by Cranston & Stowe, 1890). Rare Books: Western Americana Collection (WA) Rollins 0800. This was a family of travelers, with Helen sketching and painting wherever they went. She was the first women to paint the Mount of the Holy Cross on site in 1877 and five years later, the first to exhibit New Mexico pueblo scenes at the National Academy of Design. The Chains joined photographer William Henry Jackson on a tour of Mexico in 1883 and he might have been their tutor in photography. The 1888 trip to Europe, documented in this album, began in Dresden and proceeded through Nuremberg, Venice, Rome, and Switzerland. Classic views of well-known landmarks are mixed with very personal scenes, most notably one of Helen in bed with her feet protruding from an enormous comforter. These photographs are each trimmed and mounted with copious notes and decorative painted elements to create a unique, personal journal. This political cartoon sets Democrat Stephen A. Douglas against Republican Abraham Lincoln during the presidential campaign of 1860. From left to right, the figures represent John Bell of Tennessee (Constitutional Union party candidate); John A. Wise (influential Democratic governor of Virginia); Douglas; James Buchanan (Democratic incumbent president); John C. Breckenridge (Buchanan’s vice-president and Democratic candidate); and Lincoln. More information: Bernard Reilly, American Political Prints 1766-1876 (1991) GA Oversize E183.3.R45 1991Q and Currier & Ives: a Catalogue Raisonne (1983) GA Oversize NE 2312.C8 A4 1983Q. I can count on one hand the number of practicing collotypists in the United States and still have enough fingers left to write down their names. Master printers Accra Shepp and Edward Fausty have been working on campus all semester with a small group of students to revitalize this forgotten technique. Their finished project, an artist’s book called Atlas, is on view in the Princeton Atelier at 185 Nassau Street through January 17. There are several different ways of making a collotype, each one more difficult than the next, but if done correctly the process results in a photomechanical image with soft, continuous tone because it is made without the use of a half-tone screen. In general, a metal plate is coated with a light-sensitive gelatin solution and exposed to light through a photographic negative. The gelatin is hardened in exposed areas and is then soaked in glycerin, which is absorbed most in the non-hardened areas. The hardened areas accept the ink, and the plate can be printed just like an etching or engraving. Félix Bonfils (1831-1885), “St. 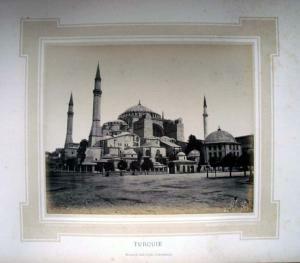 Sophia at Constantinople,” Souvenirs d’Orient: album pittoresque des sites, villes et ruines les plus remarquables d’Athenes & Constantinople (Alais: Chez l’auteur, 1878). Graphic Arts division GAX 2008. Acquired with matching funds provided by the Program in Hellenic Studies with the support of the Stanley J. Seeger Hellenic Fund. Completed in only five years, St. Sophia or Hagia Sophia is today a museum in Istanbul, Turkey. What began as a basilica, then a mosque, underwent a full restoration between 1847 and 1849, by the Swiss-Italian architects Gaspare and Giuseppe Fossati. In particular, the minarets were altered to make them equal in height, as seen in this photograph taken by Félix Bonfils taken in the 1870s. Bonfils opened his first photography studio in Beirut in 1867, working together with his wife and son. They made numerous trips through Europe, the Middle East, and later the Far East. 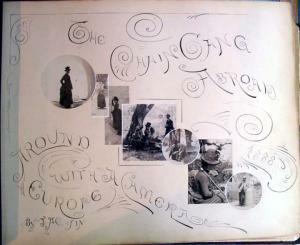 The photographs were sold individually and in luxurious bound albums published out of a second studio in Alès, France. For more information on the Bonfils business, see Andrew Szegedy-Maszak, “The Genius of Félix Bonfils,” Archaeology 54, no. 3 (May/June 2001). Auguste Rodin (1840-1917) is perhaps best remembered for his monumental bronze sculpture but during the last two decades of his life, he created many lyrical drawings and watercolors. They offered a spontaneity and freedom not seen in his earlier work, which led critics to dub them instantanés. Others called them immoral and several exhibitions were closed by the police. In 1905, Harry Kessler, director of the Weimar Museum für Kunst und Gewerbe was forced to resign after purchasing several for the museum’s permanent collection. For Americans, their first chance to see these drawings was January 1908, when Edward Steichen arranged an exhibit at his New York gallery 291. It was a high point of that art season, second only to the over-hyped Macbeth galleries show of “The Eight”. Rodin famously credited Michelangelo for freeing him from academism. 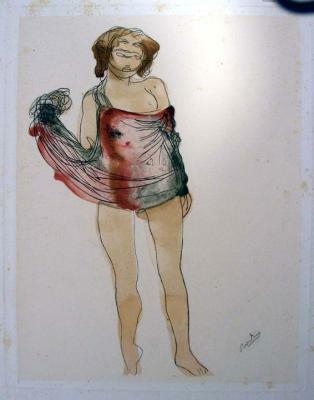 Man Ray wrote in his autobiography “Rodin’s unanatomical watercolor sketches of nudes pleased me immensely and justified my abandon of academic principles.” [Self Portrait (Boston, 1963): 18]. Henry Dawkins and Amos Doolittle. Early American Engravers of Nassau Hall. HENRY DAWKINS (fl. 1753-ca. 1786) was born in England and originally trained as a silversmith. He took up engraving before emigrating to New York City in 1754. Dawkins found work engraving book-plates, maps, and music first in New York City, then Philadelphia, and again in New York. Dawkins was arrested there in 1776 for counterfeiting paper money, and is last heard of as petitioning Congress for release from jail. 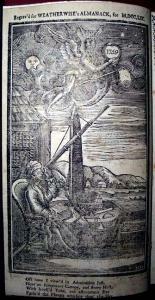 Attributed to Henry Dawkins, “Astronomer.” Frontispiece for Abraham Weatherwise (1696-1765), Father Abraham’s Almanack, (on an entire new plan) For the year of our Lord, 1759 (Philadelphia: Printed and sold by W. Dunlap, ). Graphic Arts Collection (GAX) Hamilton 36. This print shows Nassau Hall at left and the president’s house, now Maclean House, at right. Little is known of William Tennant except that he was the creator for the drawing after which this work was engraved; he is probably the William Mackay Tennent (1744-1810), who graduated from Princeton in 1763. Connecticut engraver AMOS DOOLITTLE (1754-1832) also began his career apprenticing with a silversmith, but turned to engraving. He work out of a shop in New Haven for over sixty years. His first known attempts are the views of the battles of Lexington & Concord—four plates that he engraved, printed and published in 1775. Doolittle completed more than 600 engravings, including numerous portraits and illustrations for books, music, money, and diplomas, as well as a number of bookplates. He died in New Haven and was buried in Grove Street Cemetery. 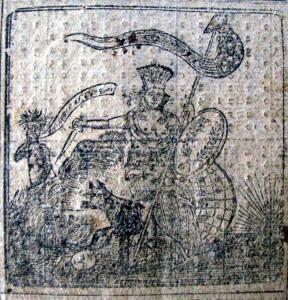 Attributed to Amos Doolittle, “Allegory of America.” Title page woodcut for Hosea Stafford, Stafford’s Connecticut Almanack, for the year of our Lord  ... (New-Haven: Printed and sold by Thomas and Samuel Green). Graphic Arts Collection (GAX) Hamilton 87. Note, the attribution is by Albert C. Bates’ Check List of Connecticut Almanacs (1914), although I do not see the initials “AD” that he does in this print. Princeton College was first chartered as the College of New Jersey in 1746 and was located at Elizabethtown; but soon moved to Newark where the first commencement was held in 1748. In 1752, the trustees settled on Princeton as the permanent site, and the cornerstone of Nassau Hall was laid in 1754, by architect Robert Smith of Philadelphia. Finished in 1756, Nassau Hall originally housed the entire College of New Jersey, as Princeton University was then named. Designed by Robert Smith and William Shippen, the building was named for King William III, Prince of Orange, of the House of Nassau. The stone structure has survived bombardment during the American Revolution occupation by troops of both sides during the war, and two fires. George Washington drove the British from Nassau Hall in 1777, and during the later half of 1783, it served as the Capitol of the United States. On August 26th of that year, Washington returned to Nassau Hall to receive the thanks of the Continental Congress for his conduct of the war, and on October 31st news arrived there that the Treaty of Paris had been signed, formally ending the American Revolution. Donald C. O’Brien, Amos Doolittle: Engraver of The New Republic (New Castle: Oak Knoll Press, 2007).